Looking for a Center for Behavior Analysis? Center-Based Applied Behavior Analysis (ABA) in Kentuckiana! Submit this (form) of you’d like to be considered, and check in frequently for call backs. (1) Funding for (ABA) services. (3) Caretaker & parent time necessary to dedicate to the program’s intensity, parent training and natural environment teaching elements typically required for ongoing program participation. This very intensive program includes individualized assessment, treatment plan and programming designed specifically for the learner’s needs, designed from a full assessment, teaching relevant skills from an appropriate curricula for the age and circumstance of the learner. This intensive program includes individualized assessment, treatment plan and programming designed specifically for the learner’s needs, designed from a full assessment, teaching relevant skills from an appropriate curricula for the age and circumstance of the learner. This consultative program includes individualized assessment and program design around the families top priorities. Consultative services typically include 100% participation from caretakers learning RAPID Skills Training (RST) for parents, teachers and others’ who care for your loved one frequently. We will be updating and informing everyone through this website so subscribe for more info. Please hang tight, thank you for your patience! Therefore, (1) Very Intensive, (2) Intensive & (3) Consultative Applied Behavior Analysis (ABA) programs for qualified students, clients, and participants of all ages are based on (a) available funding & (b) assessment recommendations for treatment, intervention or environmental arrangement. Ultimately, high-quality services are provided to individuals and their families based on the most appropriate approach. Other factors like individual assessment results, testing outcomes & treatment recommendations as well as approved, pre-authorized or verified payment plan arrangement for selected programs. All of these factors together help determine the full design of an individualized, effective and do-able treatment plan. All of these factors are assessed with you (1:1) by a professional, during the screening to determine feasibility, integrity, and overall prognosis. Before services are offered, we will ensure that you and your family will cooperate, comply and participate in the prescribed intervention program and we reserve the right to discontinue, delay or pause any component of services. Complimentary screening requests are performed online here. Submitting, scheduling and/or completing a screening does not guarantee services will be provided in any way whatsoever. We may provide alternative service options for you if our services cannot be offered at that time, or placement on a call-back list is recommended. Finally, community-based (in-home) services are offered through a separate program, see the “services” tab on the home page to explore various options and submit a complimentary screening if interested in learning more about Community-Based Behavior Support Services (BSS), Direct Support (DSP) & Counseling Services. Contact us to get more information, fill out the waiting list request form to be considered for our Center for Behavior Analysis waiting list or submit a complimentary screening request today! Check back with us often. If we do not contact you within 3-4 weeks just check back with us to avoid any inconvenience. Due to limited availability, submitting forms, emails, phone calls and/or any contact to participate in any program does not in any way guarantee placement in any program. 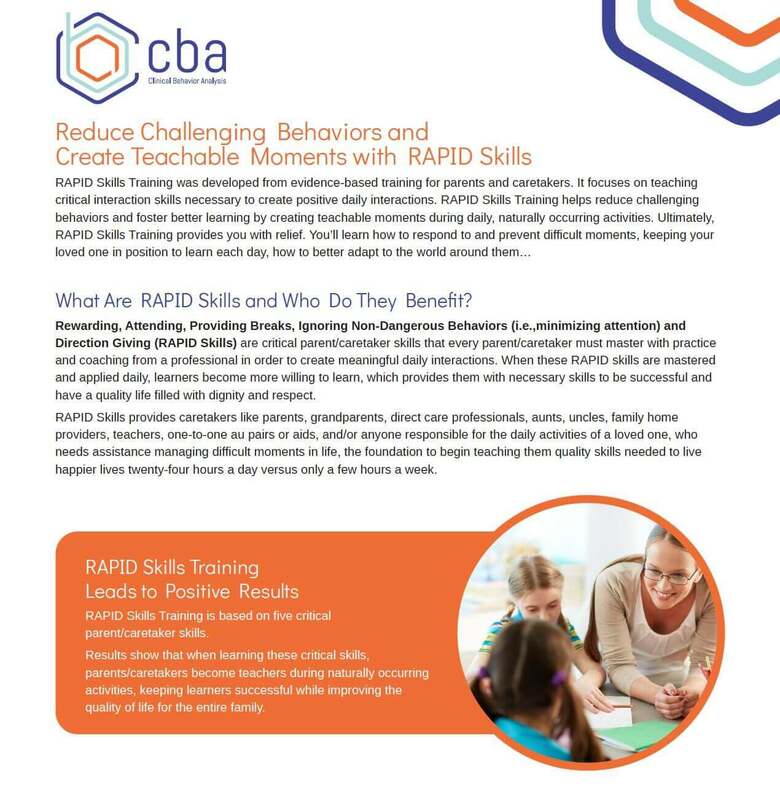 Want to learn more about Applied Behavior Analysis (ABA), Organizational Behavior Management (OBM) and parent and caretaker coaching & training? Click the video link below from the BACB! Interested in a rewarding career in the field of behavior analysis & therapy? Direct Support Professionals (DSP), Registered Behavior Technicians (RBT), Behavior Support Specialists (BSS), Board Certified Behavior Analysts (BCBA) & BCBA Clinical Supervisors are welcome to submit inquiries for pre-interview surveys. CBA’s interview process is intensive contact us for more info if you qualify. There are 4 phases to complete an application. Multiple candidate testing tasks and activities are involved as well as FBI, State, Drug, Local and Traffic (DUI) screenings, registry checks, multiple reference checks and surveys completed. All the pre-checks are conducted before the 2nd interview, employment assessment and 90-day on-the-job-training if the candidates’ pass the initial 4 phase application process. Best places to work in KY winner in 2019! Anyone can contact CBA through this form for questions or comments.